This digital collection features select items from the American National Red Cross, Wood County Chapter records (MS-0410), which consist of meeting and board minutes, annual and committee reports, correspondence, scrapbooks, newsclippings, and photographs relating to the Wood County Chapter of the American Red Cross during the period 1946-1986. Select Browse Items to view all images currently in this digital collection, or enter specific terms in the search bar to search for images on particular subjects. This digital collection contains only a selection of items from the American National Red Cross, Wood County Chapter records. The full collection is available for research at the Center for Archival Collections. View the full collection finding aid. 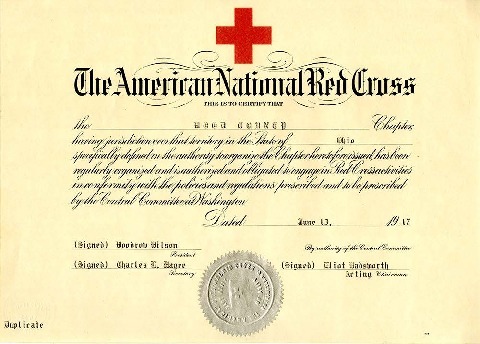 Certificate establishing the Wood County Chapter of the American National Red Cross.